Hot, muggy but most of all it was muddy. Muddy Creek Raceway truly lived up to its name early in the day at the Red Bull Tennessee National for Round 5 of the 2016 Lucas Oil Pro Motocross Championship. With the drop of the gate it was Cole Seely stealing the holeshot, but almost as quickly as the first turn to follow Phil Nicoletti took the lead early. Just behind them was Christophe Pourcel, the fastest rider in qualifying, putting on fight for second in the first lap with Seely and briefly taking the position while Seely dropped to fourth behind Justin Barcia. 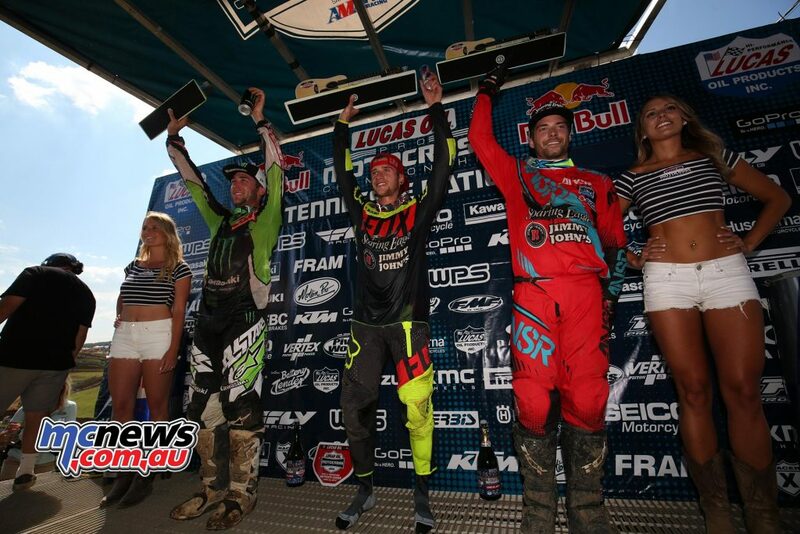 However, still within the first lap Seely would find his groove again and make moves back to first from fourth. With the top three running in order of Seely, Nicoletti and Pourcel it left Barcia holding down the fourth place position with Roczen quietly in fifth, but not for long. Over the course of two turns Roczen and Barcia exchanged back-and-forth for the fourth place position with Roczen ultimately taking the spot and moving one step closer to the lead he was after. 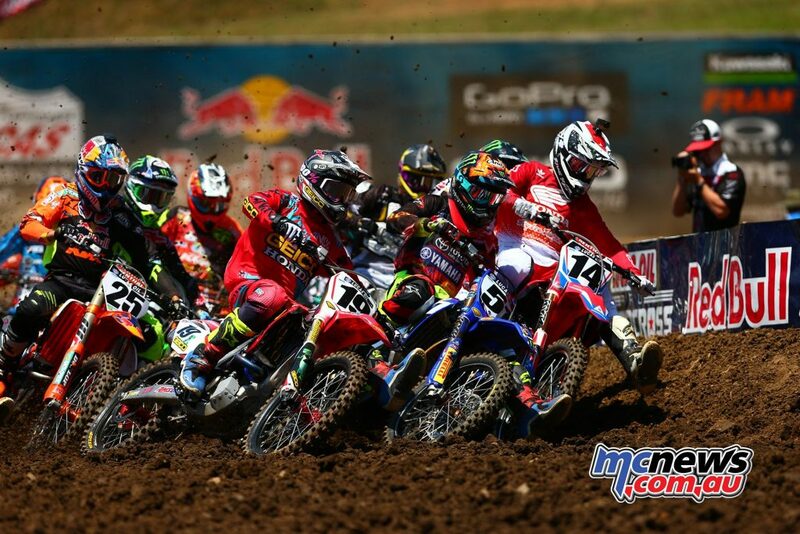 Around ten minutes into the race Nicoletti slipped behind Pourcel and found himself alongside his teammate Barcia. The two teammates would find themselves tangled up and spilling over resulting in them relinquishing their third and fourth place positions, which allowed the aggressive passer Eli Tomac into the ranks. Tomac took advantage of his opportunity to do what everyone has been waiting to see all season and do battle with Roczen. This began what quickly became the best battle of the moto for second place while Seely maintained the lead. For the next nine minutes it was all eyes on the front three runners as Seely did everything in his power to hold the longest lead he had all season, but the real battle seemed to be for second. Roczen and the hungry Tomac (who has yet to earn a moto win this series) battled for second over the course of a couple of laps before Roczen decided to take the battle to the front. Within a single minute Roczen passed seely leaving the door open for tomcat who took the opportunity to move on Seely, but second place wouldn’t be given up without a fight as Seely took it back before ultimately giving it up for a second time. With five minutes and two laps left to go in moto 1 there was official word that Barcia was off the track and out the race. 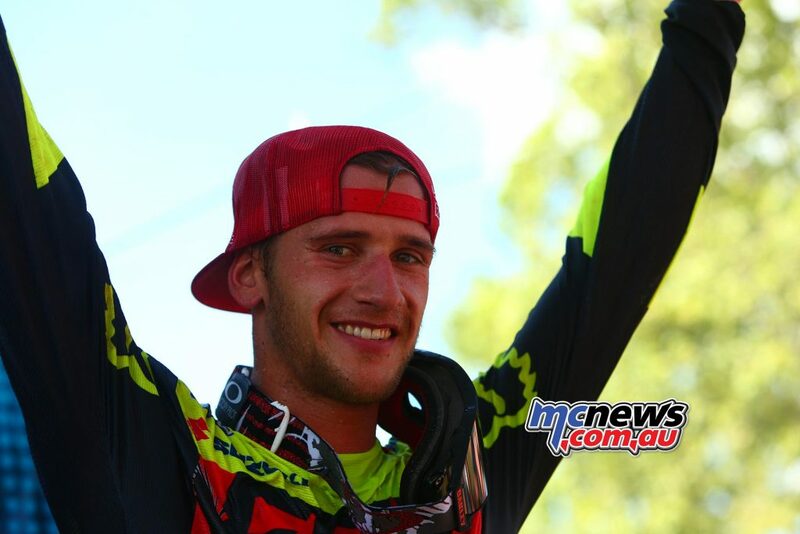 As the final minutes and final two laps came to a close the first moto would show another win for Roczen, and ultimately a greater gap in points between him and the second place finisher and overall points rider Tomac. Seely would finish the moto in third, respectively, and with a request to the announcers to stop calling him a supercross specialist. 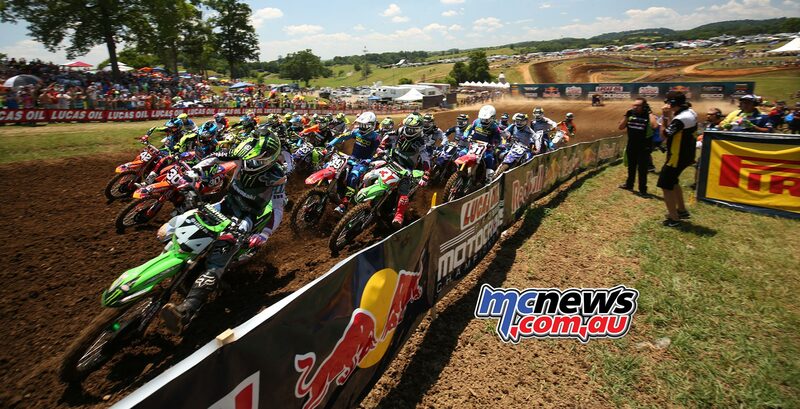 Following a longer than usual break between motos the riders lined up completely refreshed for their second moto. Broc Tickle, who was the third fastest rider in qualifying, took the holeshot and was followed closely by Justin Brayton and Marvin Musquin. 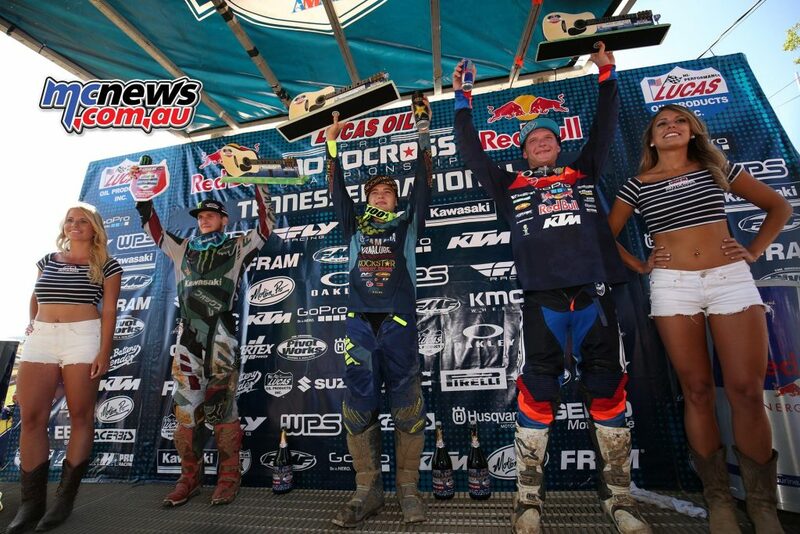 Just behind those three were the top three from the first moto in order of Cole Seely, Ken Roczen and then Eli Tomac. Very early in the opening lap Tomac made an early pass on Roczen, but Roczen quickly answered with a pass on both Tomac and then on Seely. Next up Roczen took second place away from Brayton with an outside pass while still inside the first lap. Still determined, Tomac showed he was still focused and managed to pass Brayton and Seely at once. However, Roczen was staying busy as well with a pass on his teammate Tickle. With the first five minutes of the second moto gone it was Roczen in the front followed closely by teammate tickle with a determined Tomac in hot pursuit. Within the next five minutes Tomac had made it happen and passed Tickle to put in work on Roczen once again. Looking back at the battle for sixth, Musquin settled down after his quick start and was working to hold off Weston Peick and the return of Blake Baggett to this 2016 series. Baggett was forced to take a few rounds off following an injury to his collar bone and shoulder, but clearly he had not been sleeping in his time off as seen by his fighting for the front on the track. 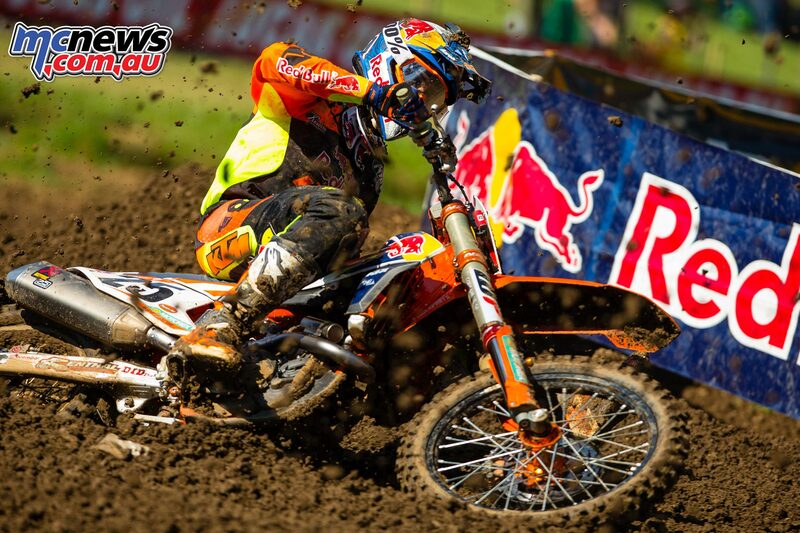 Musquin, however, was the one to watch. As Brayton faded from the front, Musquin came in hot and not only found fifth but continued his momentum to find fourth out from around Seely. Still, Baggett wasn’t ready to be forgotten and quickly found his way around Peick for sixth leaving Justin Barcia next in line to battle for seventh. And that is just what he did over the next minute as he overtook Peick and pushed on toward Baggett. By this time Brayton had dropped back behind the entire bunch. As the race came down to the final three laps it was all eyes on Tomac trying to overtake Roczen, and it was close for every single corner. Roczen made a mistake coming over a double but quickly recovered. Then Tomac opened up and tried multiple alternate lines nearly passing while also nearly coming off his bike, but Roczen held him off into the final lap. 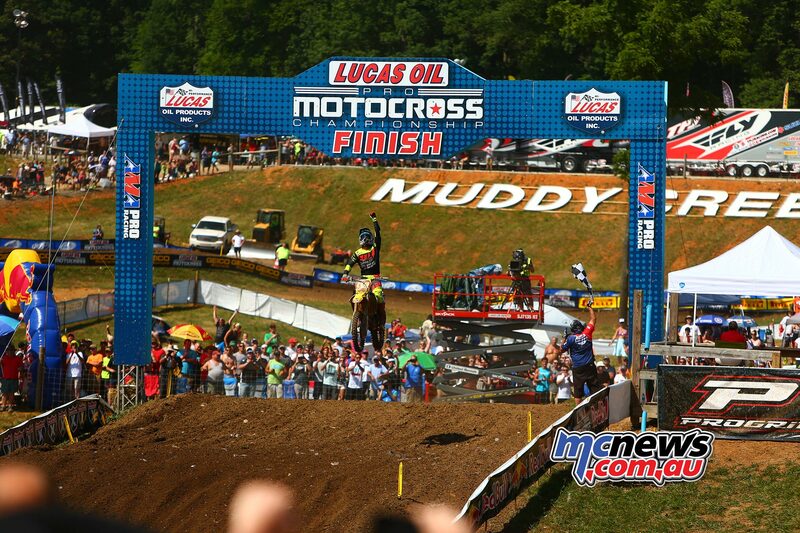 With an insane battle around every turn, Roczen managed to hold off Tomac and take the win and Tomac taking second. 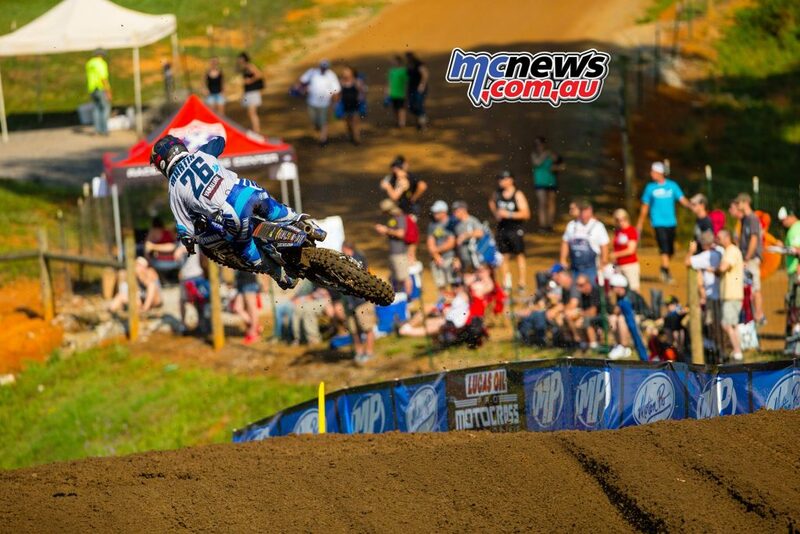 Luke Clout posted 23-19 results and had a good ride in the second moto. Clout was looking on course for a top ten finish in the final bout but then could not maintain the pace and drifted back to 19th by race end in the trying conditions. 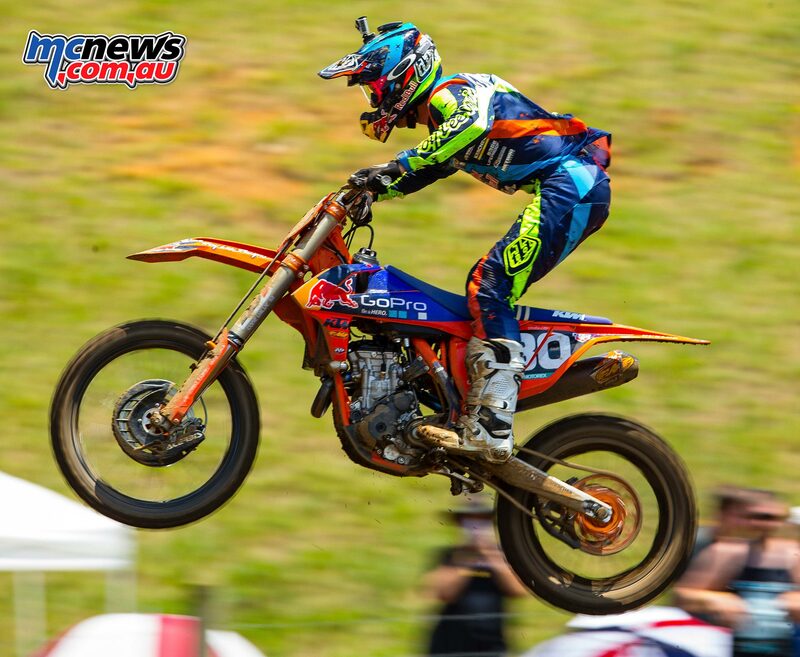 The temperature read 85 degrees and the humidity was at whopping 43 percent — Muddy Creek Raceway brought the heat for the first 250 moto of the Red Bull Tennessee National. AC gets holeshot (making for back-to-back moto hole shots and three consecutive races) with Savatgy right on his tail but held off on the opening rounds of turns, then Jordon smith showed up and took over the second place spot with martin davalos taking third from Savatgy but not for long as savatgy would quickly climb back. Looking back to the start, Jeremy Martin missed the jumpsuit of the gate and found himself pinched in the opening turn which landed him deep in the pack. 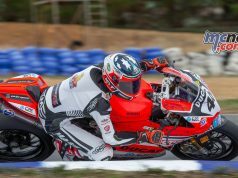 With five minutes elapsed in the moto, Jeremy was found sitting just outside the top-ten in eleventh. Taking his great start and high speeds, AC (the fast qualifying racer) held his lead for the first five minutes of the race. But then, with nobody in a direct battle with him, AC took a dip, dumped his bike and let go of his lead to Smith. 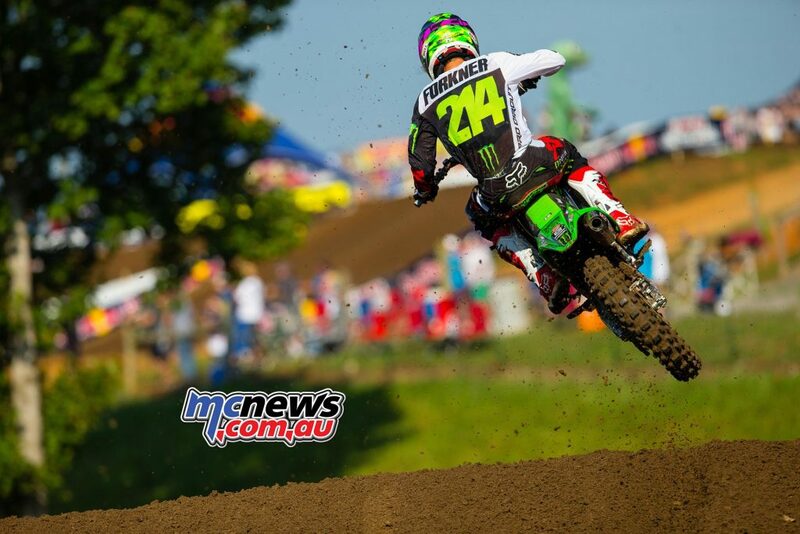 AC would drop to third while Savatgy would takeover second. Smith maintained his first lead of the season for a number of laps, but following the straight and fast stretch that sat in front of the fans Savatgy would follow-up with a quick turn and take the lead from Smith. 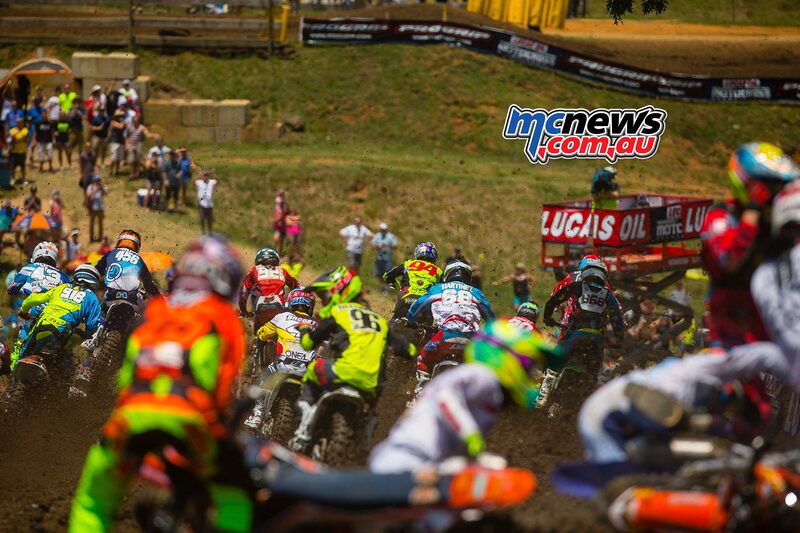 Slightly deeper in the pack, Davalos was doing his best and holding off the determined local boy, Cooper Webb. 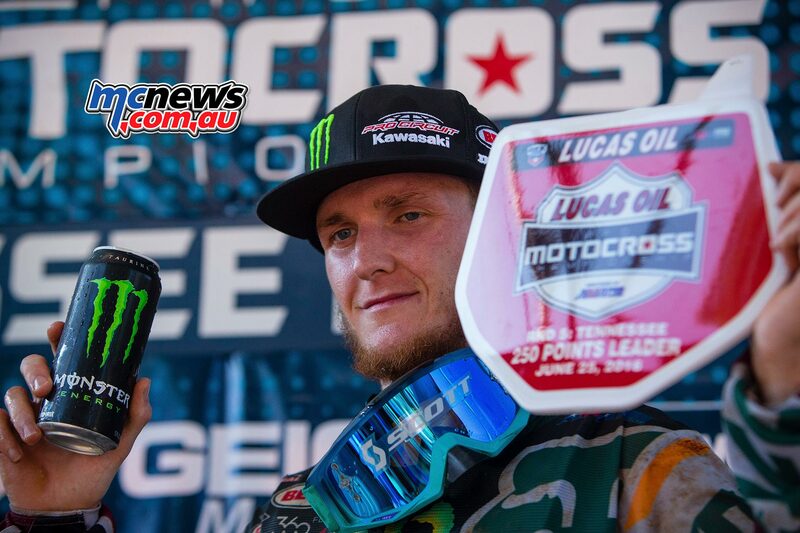 Few riders know Muddy Creek as well as Webb and he would show his familiarity and confidence following a squabble while almost completely under Davalos on the top of a table. After regaining his composure, Webb straightened out and immediately took a pass on Davalos for the fourth place position. Back up near the front, AC showed a change in approach from his early laps as he took to longer lengths along the outside of a few turns. Smith could see AC closing in on him and managed to cross lines with AC to slow him on the way up to the triple step-up, The Bomb, to give him a bit of breathing room. Still, AC kept his cool and over the course of another handful of turns he found his opening and made a successful move to pass Smith and take second. Unfortunately for AC he would not hold on for long. Taking a second dive in the opening moto, AC would lose his podium position yet again and this time he would not be able to recover with such grace. 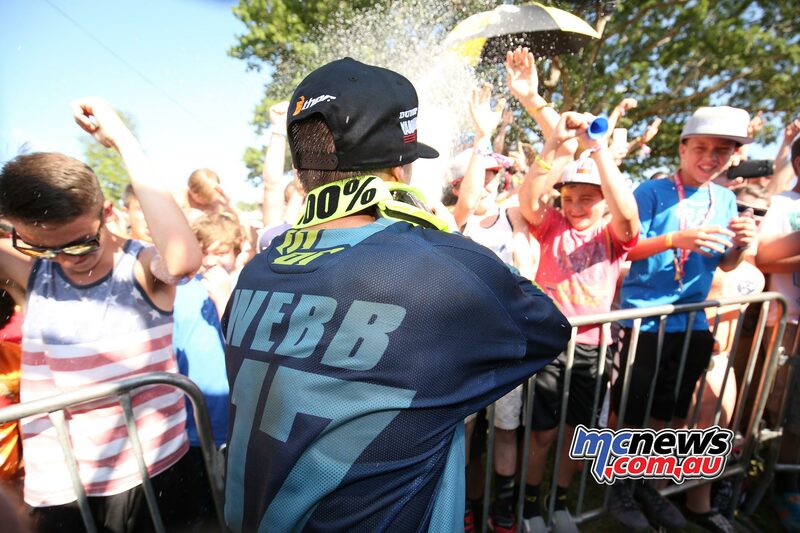 Webb on the other hand found himself continuing his gain toward the front of the pack. 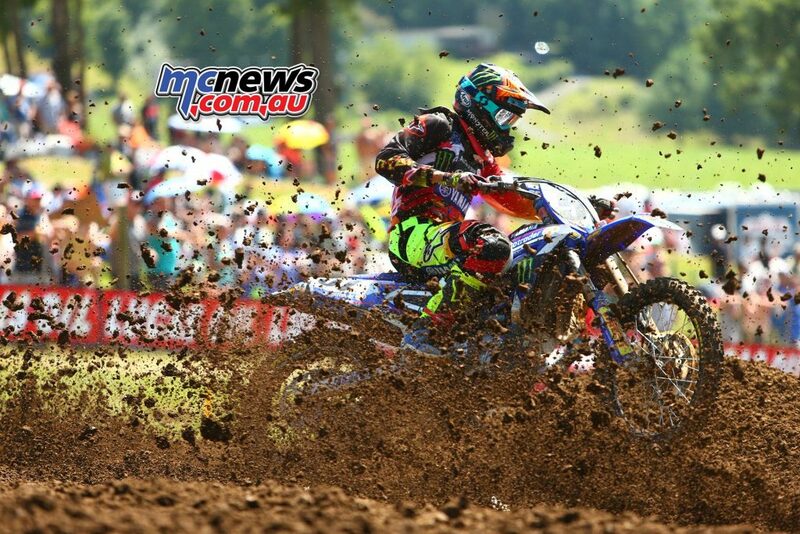 After overtaking Smith, Webb pushed hard for his chance to take on the leader, Savatgy. Smith, though, continued to lose positions as another local boy, Zach Osborne, came up from behind and found a way around. 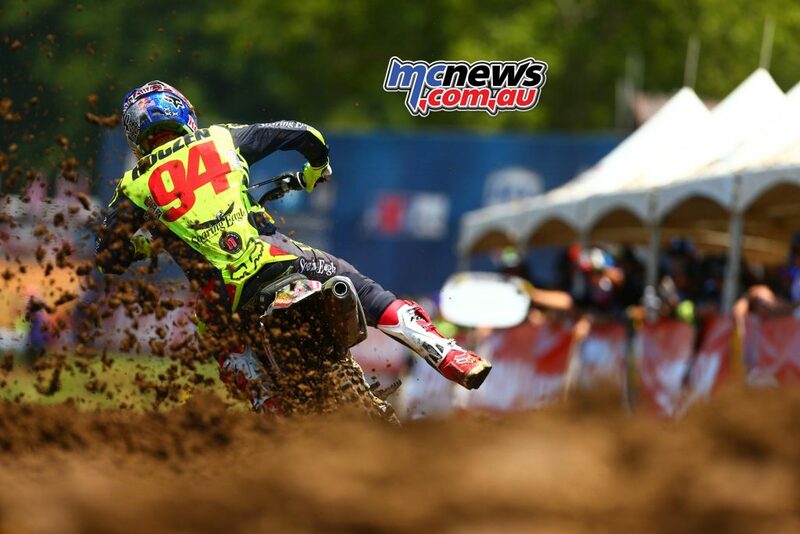 Osborne found his first career moto win the weekend prior at High Point and showed his confidence was continuing at Muddy Creek. Behind Osborne was a race for fifth with Shane McElrath holding off Alex Martin and the determined Jeremy Martin who climbed into a favoring point position. 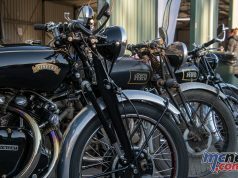 For the next few minutes the three would be tight in turns, but Alex ended up making a mistake and giving the sixth position to his brother after a quick dive he had another minor bike malfunction when he tried to restart his bike. After almost a minute of lost time Alex managed to restart and get back to work. 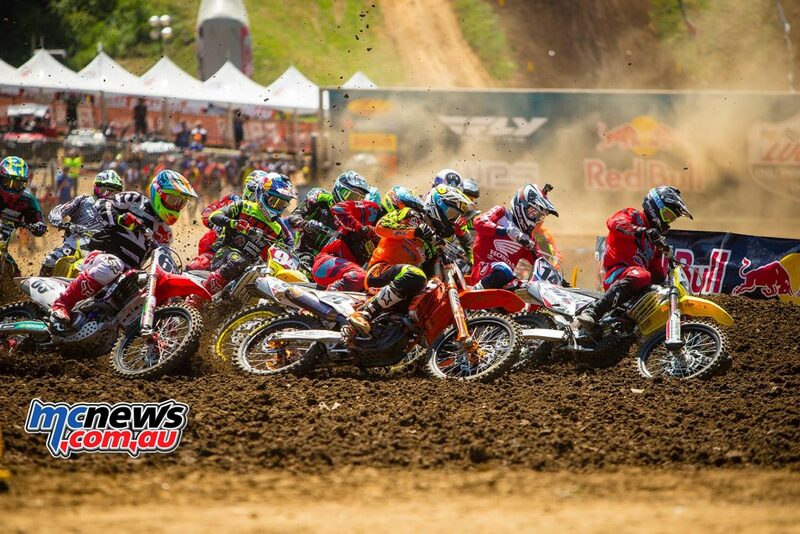 During the final two turns of the moto Jeremy Martin and McElrath would exchange passes for the fourth position and just as it looked like Jeremy had it in the bag McElrath returned to steal it back with just a matter of seconds to hit the finish. The top three for the 250 moto 1 would finish in order of Savatgy, Webb and Osborne. Shane McElrath, also a local to the track, came out for moto 2 and takes his first holeshot of the series but sure enough it would be relinquished to Alex Martin. 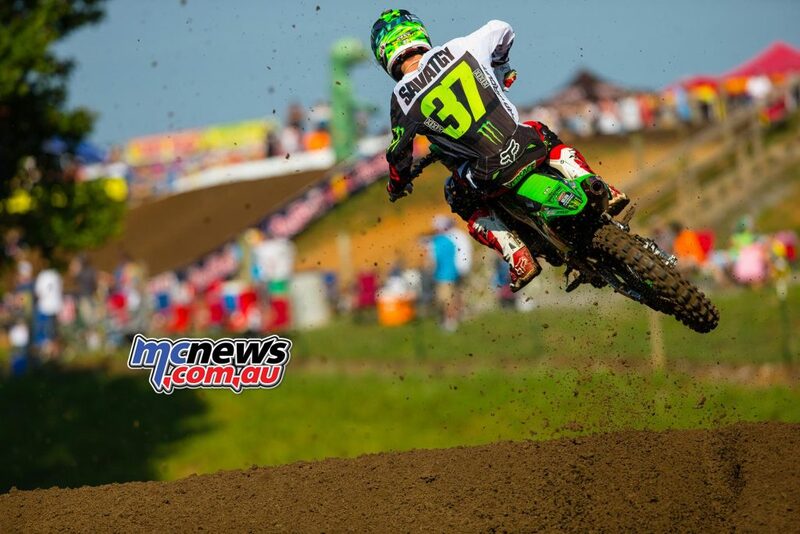 Adam Cianciarulo would hold third from Joey Savatgy. 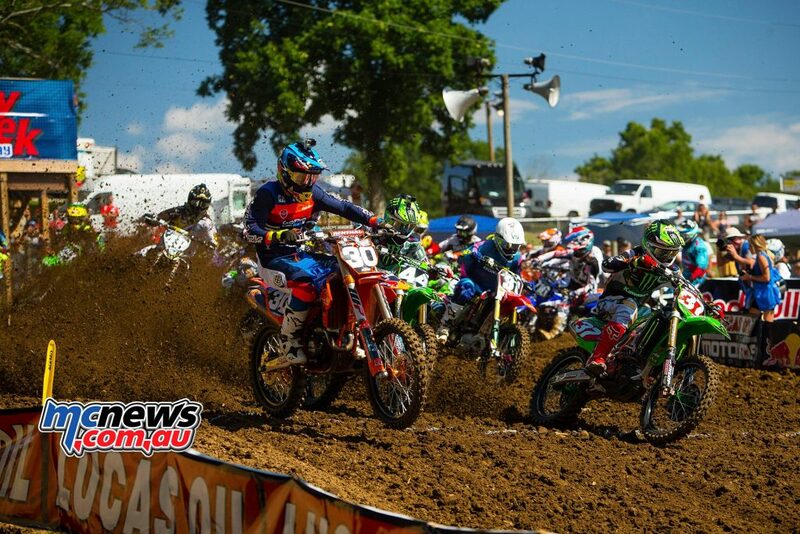 Then, back to the front of the pack, McElrath decided he wanted the lead back and show Alex Martin his speed. Alex wasn’t going to give it back without a fight and for the following two turns they were neck and neck but McElrath was able to keep the front. A few places back was Savatgy making moves into third until he nearly landed on Alex Martin in an aggressive move to keep pushing forward. But after another lap Savatgy would go down and give up 7 spots and have to put in work to recover from eighth. 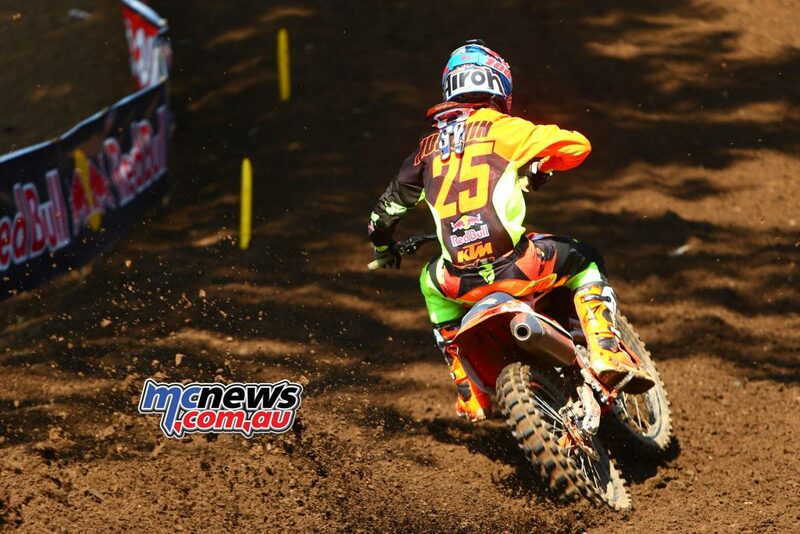 This left the leaderboard reading McElrath out front followed by Alex Martin, Jordon Smith and AC. Unfortunately for AC he had his third slip of the day that dropped him all the way to 18th. From there the battle to watch became that between teammates Austin Forkner and Savatgy as he slid behind smith. Savatgy and Forkner exchanged multiple passes in extremely close quarters, and just when it looked like Savatgy had it sealed Forkner grabbed it back and took off. 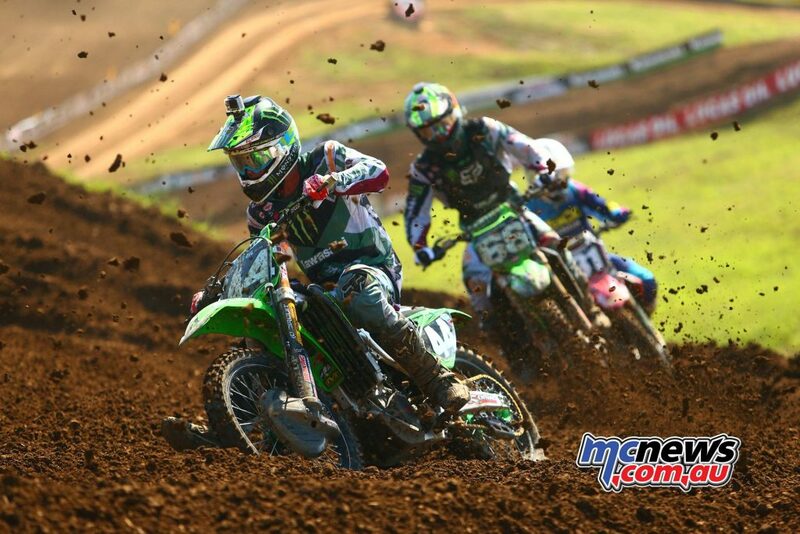 Shortly after Savatgy took a spill and dropped multiple positions. Over the course of the next five minutes it would be Forkner to watch as he climbed his way into fourth place with Webb coming in behind him for fifth, but it wouldn’t stay that way for long. 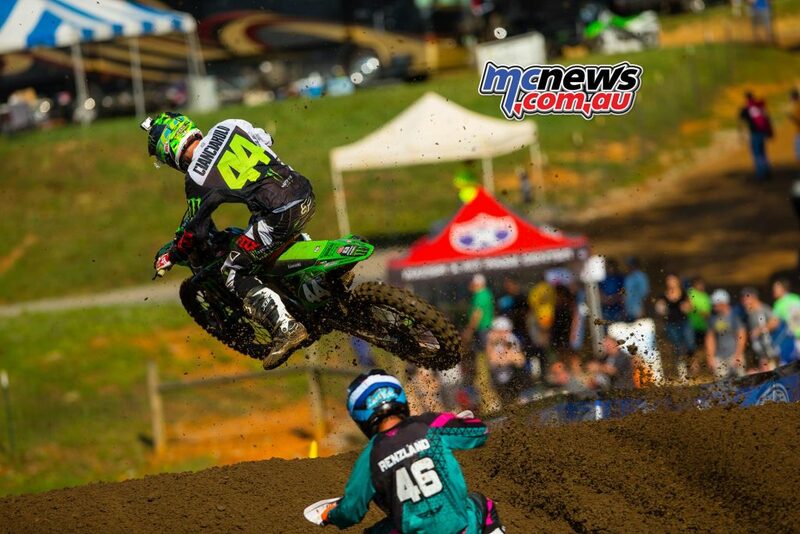 Webb made his way past Forkner and began to set his sights onto J. Smith for the next rung up the leaderboard ladder. And another minute or so later he did that, too, which had the leaderboard reading with McElrath still leading ahead of A. Martin and then Webb in front of J. Smith and Forkner. Forkner managed to move ahead one more spot in front of J. Smith before the time would run out and the final laps would begin. Another move would be made by Webb on his teammate A. Martin just prior to the two lap mark, making for two locals to Muddy Creek leading the pack and prepared to battle. As the locals entered the final lap of the race Webb lived up to his expectations on the day. 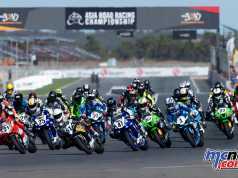 Webb had stated on the podium of the previous race and again after the first moto that he was determined to take the win. 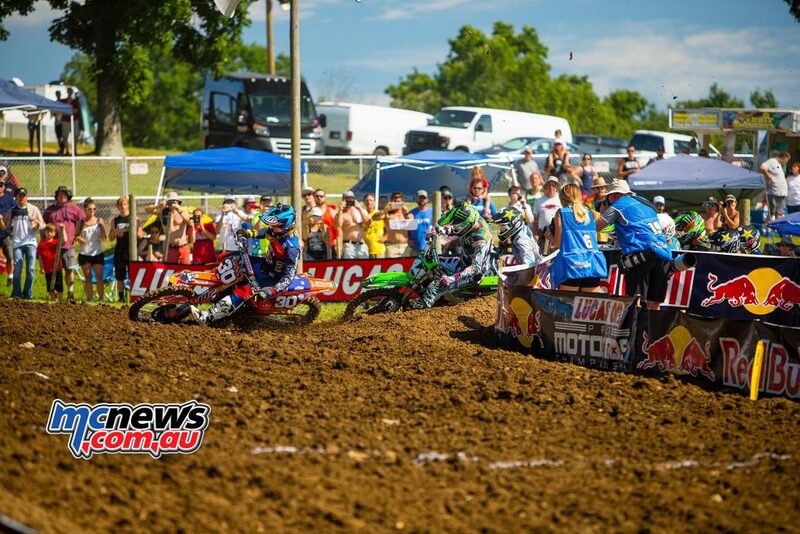 Webb and McElrath rode aggressively against each other with McElrath holding off Webb on multiple attempts. 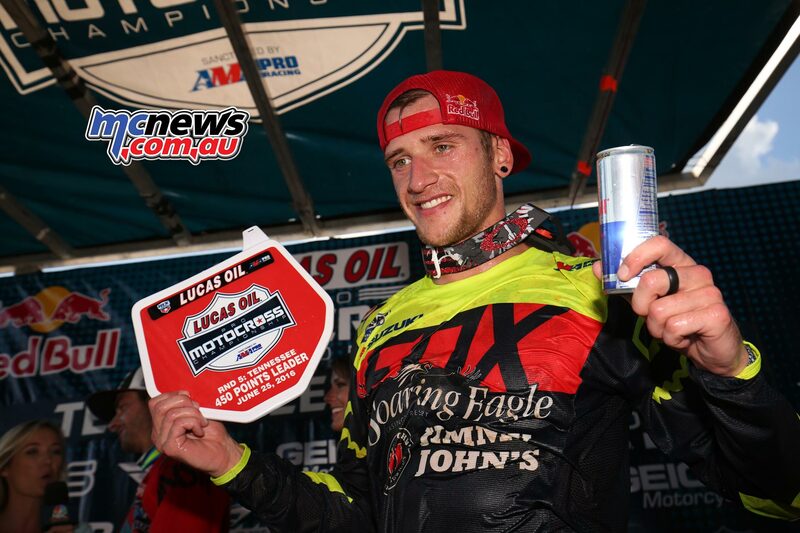 But before the race was over Webb found his opening and he took it not only for the pass and the moto win, but also for the win on the day exactly as he wanted.